Production Company: New York Motion Picture Co. (Triangle Film Corp., distributor). Producer: Thomas H. Ince. Director: Charles Swickard [and William S. Hart, uncredited]. Writer: C. Gardner Sullivan. Photographer: Joseph August. Title Artist: Mon Randall. Cast: William S. Hart (Blaze Tracy), Clara Williams (Faith Henley), Jack Standing (Rev. Robert Henley, her brother), Alfred Hollingsworth (“Silk” Miller), Louise Glaum (Dolly), Robert McKim (clergyman), John Gilbert and Jean Hersholt (among townsfolk). Transfer Note: Copied at 18 frames per second from a 35mm tinted print preserved by the Museum of Modern Art. New Music: Martin Marks, piano. Running Time: 64 minutes. More than anyone else, producer Thomas Ince revitalized the genre. He sought new authenticity by employing an Oglala Sioux tribe and a Wild West show as his troupe on the twenty-thousand-acre “Inceville” ranch above Santa Monica. Ince’s expansion into multi-reel Westerns in 1914 rested, however, on one old friend from their barnstorming days as actors: William S. Hart. Hart, already nearly fifty before his film debut, became the first star of feature-length Westerns. Born in New York in the last years of the Civil War (1864 or 1865, though he later claimed 1870), Hart grew up in the Midwest. After success as “Ben-Hur” on Broadway in 1899, he starred in stage Westerns, including The Squaw Man and The Virginian. He later took pride in having brought “truth” and “realism” to a genre familiar to moviegoers through “Broncho Billy” Anderson’s lighthearted one-reelers, but what Hart actually brought was a new seriousness and stoicism, evident even in his drawn facial lines and unyielding posture. Hell’s Hinges, Hart’s sixth feature for Ince, ranks with Cecil B. DeMille’s 1914 version of The Virginian as the most famous early Western feature. It bears small resemblance to later Hollywood formulas. The town known as “Hell’s Hinges”—“a good place to ‘ride wide of’”—is a wild frontier settlement. In later films, such a town would be tamed by a lone hero who would bring law and set the community on its path to civilization. Hell’s Hinges has nothing of that optimism. As in most of his films, Hart in Hell’s Hinges plays a “bad” but reformable man, who first reads the Bible entranced, cigarette and liquor at hand. He is not merely a “loner” but deeply alone, even when sporting a smile and drinking with the town boss in his huge saloon, “Silk Miller’s Palace of Joy.” The film’s structure is surprising. Hart is not introduced until more than ten minutes into it, and there is little resembling “action” until the halfway point. Initially the focus is a New York minister (in a convincingly foolish performance by Jack Standing), who arrives out west and violates propriety to an extent never allowed men of the cloth in later Hollywood films. He takes to drinking, sleeps with the town whore, and torches his own church before dying by a stray gunshot. The town’s pious citizens are “a drop of water in a barrel of rum.” From its measured start, Hell’s Hinges builds to a nightmarish intensity, “while evil and madness join hands in the triumph of victory,” as an intertitle puts it. Hart’s character arrives back in town in time only to make the last judgment. Most of the film was directed by Hart himself (from early September to late October 1915), although as usual he left screen credit to a collaborator. The longstanding dispute about how active a hand Thomas Ince took in his productions—he is said to have overseen the burning of the town here—misses the point about his innovation: Ince pioneered the producer-centered division-of-labor system in Hollywood and thus was able to supervise several films simultaneously. 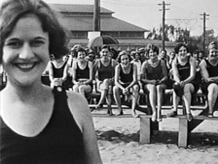 By the time of Hell’s Hinges, Ince and Hart had molded a regular team, including scriptwriter C. Gardner Sullivan (who also wrote Hart’s first feature, The Bargain , and final film, Tumbleweeds ), co-star Clara Williams (also from The Bargain), and cinematographer Joseph August (whose shadowed expressionism for John Ford in The Informer  and They Were Expendable  is anticipated in the smoke-shrouded silhouettes ending this film). The cast also includes Louise Glaum (as the prostitute Dolly), a minor siren who would star in 1920 films. Future silent idol John Gilbert can be glimpsed as a rowdy cowboy, a mustache masking his mere sixteen years. Sources indicate that a compilation score for this feature was prepared at the time of its release, but no copy is known to survive, nor does any cue sheet. So I set out to create a compilation score of my own that could stand tall alongside those played for silent Westerns throughout the teens and twenties. Accordingly I used many action pieces written for the genre during those decades, for example, “Cowboy Music” and “Cowboy Dance” by Lampe, a “Western Allegro” by Falck and another one by Riesenfeld, a “Western Scene” by Zamecnik and another one by Bergé, and “Galloping Furies” by Rapée. At the same time, since this is an unusual Western, especially for its emphasis on religious elements, I drew from the rich heritage of church music that then circulated. Some of this repertoire will easily be recognized, such as “Lead Kindly Light” and Handel’s so-called “Largo”—both included in virtually every piano anthology of the period under the category of “religion.” Others are more remote from current practice but well suited to the film in both style and message. The rather stern hymn “Once to Every Man and Nation” (Lowell , Williams, 1890), for example, underscores the film’s emphasis on those defining moments of moral choice, when one enters the ranks of the damned or the elect. Then, too, the score includes many secular and gentler examples of Americana, among them a wonderfully appropriate and concise cowboy love song with these lyrics: “When the curtains of night are pinned back by the stars, and the beautiful moon sweeps the sky, I’ll remember you, Love, in my prayers.” If any tune can claim to “speak” for the ruggedly silent yet poetic William S. Hart, this may be it. The striking, authentic color tints of Hell’s Hinges were preserved by the Museum of Modern Art from an original nitrate print. The most compelling introduction to William S. Hart comes through a visit to his ranch in Newhall, California, donated at his death in 1946 to the County of Los Angeles and maintained as a museum and park. By the terms of his will, admission is free. Hart is featured among the “Cowboys of the Silver Screen” stamps, issued by the U.S. Postal Service in April 2010.